The food ran out. The boys had eaten all the elephant meat they had bought with them. My food was finished, but the cartridges were not, thank goodness. I remember ordering a cartridge belt from Rigby to hold fifty rounds. He asked me what on earth I wanted with so many on it. I said I like them and there was a time when it paid to have them. Small Bores Versus Big Bores was written almost 30 years after his last African adventure Bell's piece for American Rifleman gives an insight into what he believed were the criteria when choosing a rifle for hunting dangerous game. There is a bit of controversy about this article, not because of what Bell wrote, but because of what others have mis-read into it. Some say it was badly edited, some say Bell had access to preproduction rounds. I've seen this misunderstanding quoted several times, but as it's Col. Cooper the armchair heros are parrotting..
A lot of static was thrown our way when we mentioned that article by Karamojo Bell, which appeared in the American Rifleman many years ago pointing out that if he went back to Africa he, Bell, would take with him a 308. It turns out that the 308 had not appeared at the time Bell's article was published. About all I can assume here is that we have an editorial mishap. My best guess is that Bell stipulated 303, and that his copy was "corrected" by somebody in the composition room. Reliable ammunition: (both on ignition and on impact), available and affordable. 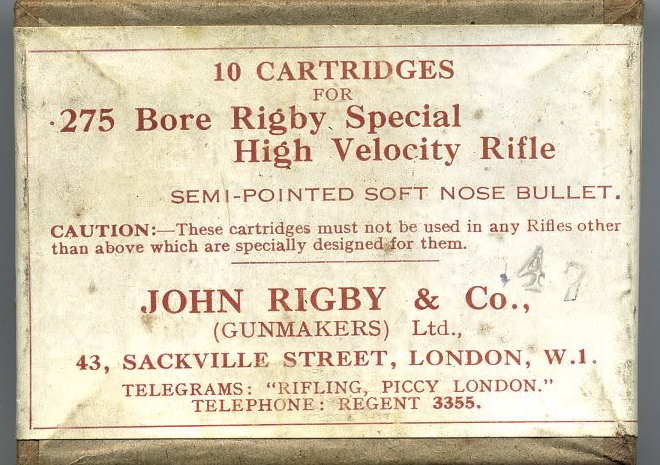 Rigby's .275 rounds were only 10% of the price of the 'express' calibres used by the famous London double rifles. There's a lot of walking involved. 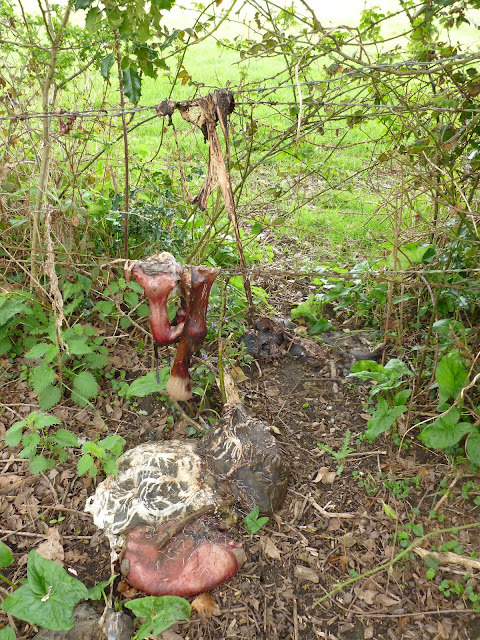 Big shout to The Bambi Basher who had a .275 Rigby case and scales to hand. Which brand and model of rifle would Bell be carrying today? Your answers in the comments section please! I picked up my copy of the magazine on Ebay for $10 inc. shipping. I first learned about Bell through shooting the .275 Rigby, the tweaked Mauser Rifle he's synonymous with. Rigby bought the workings from Mauser in Germany, smoothed away the tool marks, added his own stylish woodwork, the best barrels available and money no object gunsmithing to set them up. By using a different system of measurement the military (and continental) 7x57[mm] Mauser became the (British) .275 Rigby sporting rifle. A name forever linked to WDM Bell. Written some years after the fact Karamojo Safari is Bell's second book, widely held to be the best of the Elephant hunting genre, and a glimpse into the Africa of a hundred or so years ago. This adventuring is a risky business: day in day out, for years on the trot. In a world before antibiotics; where every few seasons whole african nations would be swept by disease, where lurgy carrying bugs patrol the air, land and water, inter-tribal wars flare up, slavers prey on the smaller settlements, brigands kill whole trading caravans, and any number of mishaps can befall a gentleman on a shooting trip. Life has the potential to be full of vigour, and equally the potential to be short. Very short. Having started young Bell is only in his early twenties when he sets out to make his fortune as an ivory hunter. He'd had already tried his hand at being a professional meat hunter in the Klondike and Lion culler during the expansion of the railways across Uganda where the Government had offered a reward for every lion killed within a mile on either side of the railway. Boyhood dreams of adventure not yet sated, and a young mans dreams of hard cash drew him to try his hand providing ivory for the london trade. Risking all during sixteen and a half years of long safari's off the edge of the map, in the very last days of Africa before the Europeans. 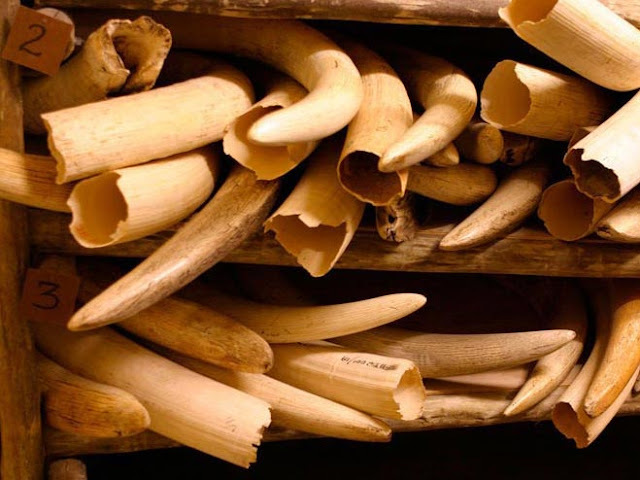 In Africa, in the old days, in what's now known as Kenya and Uganda on the map and Karamoja on the ground, there was ivory, basically just lying around all over the place. It was gathered and traded. Elephants were always killed by the locals for food, hides, ivory and to protect crops. Usually with snares, pit-falls, and falling spear traps, just not in very large numbers. Elephants live a long time before they die of natural causes so with the growing trade route to europe supply of found ivory was outstripped by demand and the price started to rise. Muzzle loading rifles struggled to generate the stopping power or accuracy required to ensure a clean kill. Unless of course the shooter was almost at spitting distance, and made an 'engine room' shot to the heart and lungs. The trouble with an engine room shot at very close range is it leaves the nervous system intact with the animal still animated for a few very long seconds. Pretty much the only thing more dangerous than an Elephant at close quarters, is a mortally wounded Elephant at close quarters. With such a prospect for loss of life Elephant hunting was more organised than opportunistic. A potentate or king could dispatch troops to hunt Elephant for him, but a village was unlikely to often risk its workforce on such a venture however much food, crop damage, and trade were at stake. Bell is famous for using the .275 Rigby, but the way Bell tells it his adventure was made possible by the evolution of ammunition, both the .303 British and the .275 Rigby he used for Elephants were the latest kit, gone were the days of having to hunt with blackpowder rifles that fired 0.1lb to 0.5lb [!] bullets pushed (slowly) by gunpowder. Bell was shooting at the dawn of the modern Nitrocellulose ammunition with its much higher velocities, and much tougher bullets that can penetrate thick skulls and mud-encrusted hide. With these quieter, lighter, more powerful and more reliable rifles Bell could hunt with less equipment, and not being disorientated by the blast could take quicker follow on shots at second and third animals who were merely puzzled by the crack of its report rather than panicked at the boom of the big bore rifles. Hunting in territory well outside the influence of the colonial powers Bell had to be diplomat, trader, and ace negotiator. Where he could he acted as pest controller - adding to his reputation as a benevolent passer-by, culling elephants that were eating and trampling a settlements crops. In wilder places he set out to gain the consent of the local head man favouring the tactic of walking, preferably unarmed, into the village and asking permission of the headman to hunt his lands. By not acting as though he owed the place he set himself apart from the colonial powers and became an accepted part of the landscape. Word that "Red Man" was in the area with his little rifle that dropped big animals would go before him, his well known offer of cattle for whomever found him Elephants meant the local lads were always keen to help him out. In tribal societies the ownership of cattle was everything. For the local lads this would have been a literally life changing deal, one that would mean they could afford to marry, and have a wife/slave of their own. With a wife to grow stuff, weave baskets and mats, brew beer, and preserve foods the low born male would have a source of income, and the potential to be able to afford a second wife/slave. Helping Bell was literally a way to get on the ladder. Bell took the Ivory and the locals got the meat. Tons of it, Bell was a popular fellow. Karamojo Safari is quite the tale, but I'm very glad I read The Wanderings of an Elephant Hunter first. Karamojo Safari would have benefited from the guiding hand of an editor, that said its a fascinating tale in 279 pages, just I couldn't help but feel that it would have been a really riveting tale in 179 pages. Instead of the tribal intrigues and anthropological musings of Wanderings he takes us to the moment of the shot so many times that, this reader at least, became inured to it. As the book entered the home straight I found myself thinking 'If he climbs up on to the body of the first Elephant to shoot the second one more time I'll jump into the path of the bullet to spare myself the tedium.' . The days he describes are long gone, and his style of adventure will never be seen again, so Karamojo Safari is what it is. A fascinating if flawed tale from the last days of pre-colonial Africa. If you like hunting and adventure stories you'll not be disappointed, personally I wouldn't bother with the massively over priced facsimile edition when for a few bucks more you can get an old edition that'll keep (and possibly gain) value, and has that awesome old book smell. A chap, we'll call him HunterX, wrote to me a few weeks ago, said he was a reader and invited me to go stalking with him. 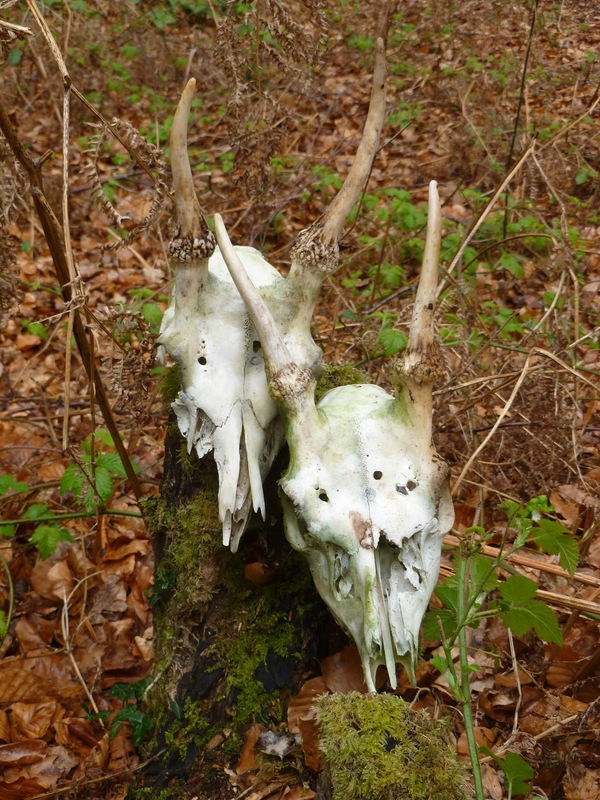 We to'd and fro'd over the email and finally his commitments match up with my commitments and we ended up at this weekend, the tail-end of the Fallow buck season. So once again; I set off to meet a man, an armed man, I met on the internet, in the woods. Ex Mrs SBW: Excellent! Where are you taking them? SBW: I can't take them! I'm going deer stalking! We agree to meet at 4am for the two hour drive to his stalking ground, and what a stalking ground. An estate that borders a national park, four species of deer, lots of small game, and a 200 yard rifle range. On the way there the temperature drops and it stars to rain, perfect weather in other words. Our arrival turns out to be auspicious, I've always been taught that an unloaded rifle is just a stick, so load-up as soon as you get out of the truck because your first [or only] chance might be in the first few yards. Hmm yes. This time the first chance was a very chubby Grey Squirrel waiting for us on the estate side of the gate. 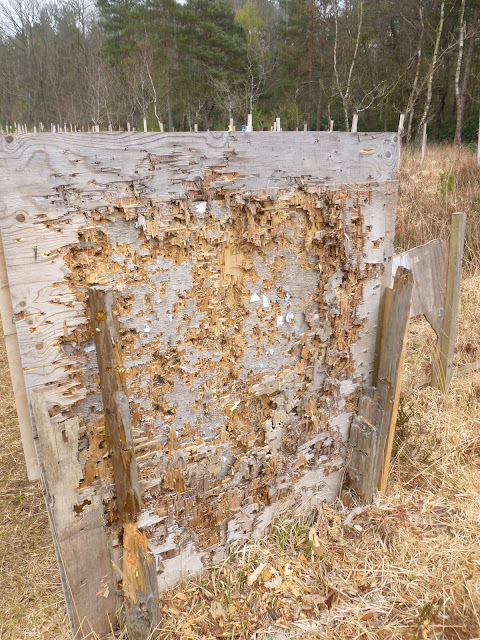 Air rifle still in truck, 17HMR missing magazine, .308 not really what you'd call a Squirrel calibre, .22LR finally hauled out from under the other cases only for HunterX to miss at, well he called it ten yards but more about his range estimation later. 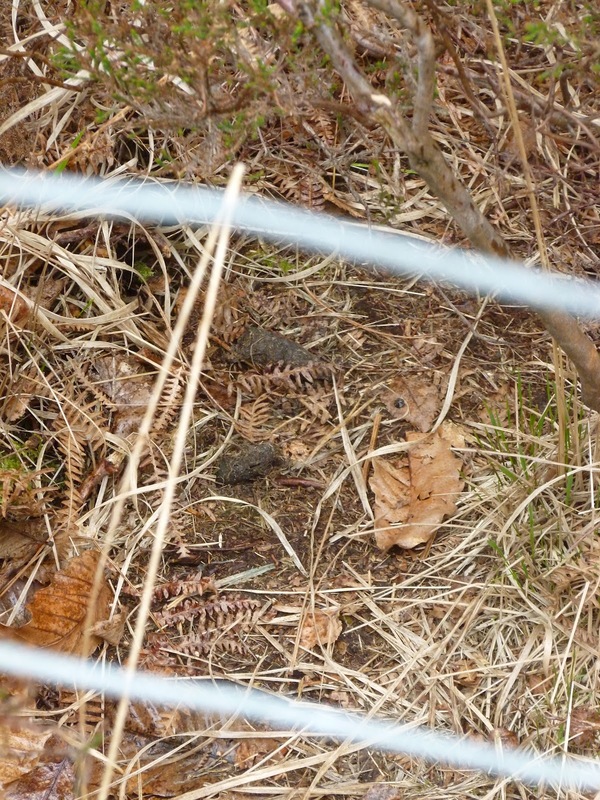 Much sniggering ensues as we stalk up into the woods, long 'rides' separate blocks of woodland. 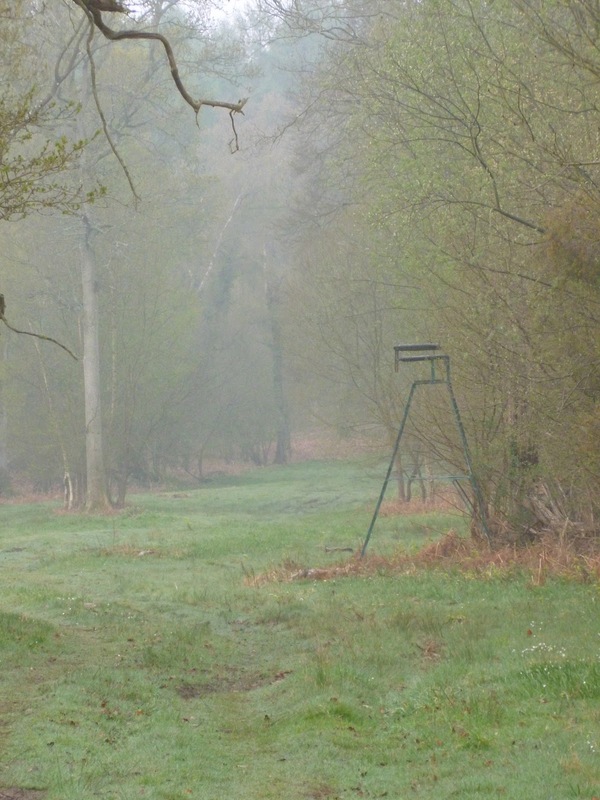 Mist clings to the ground, it couldn't look more 'woodland stalking' if it tried. 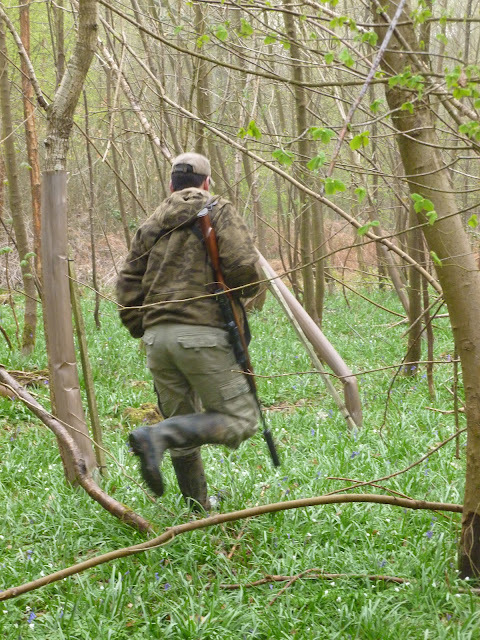 A shootable Roe Buck scoots across the ride we're walking on, head down, and intent on something other than evading us. The next opportunity is also a squirrel. We're neatly concealed by some coppiceed Beech trees and the Grey Menace is cavorting on a fallen tree, I crawl into what looks to be child's-play range and send a .22 sleeping pill straight over his head, he doesn't stick around for me to take another shot. Honor looking decidedly sketchy on both sides we retreat to the range. Not too shabby - for 50 yards! 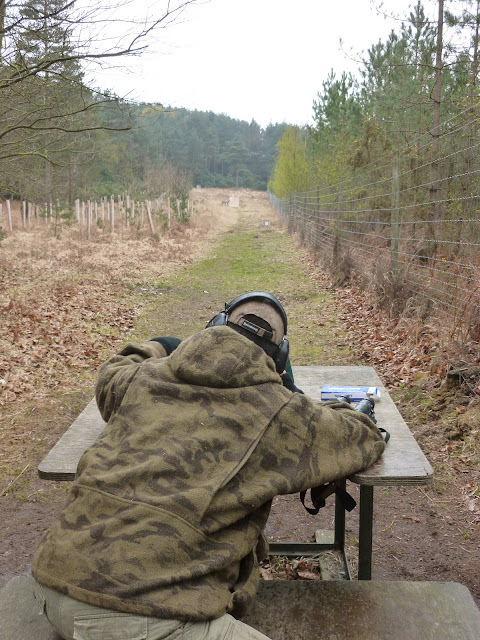 HunterX was curious about PCP air rifles and had asked me to bring the Parker Hale Phoenix .177 which acquitted itself admirably even out at 50 yards! - i.e + 60% of its effective range. 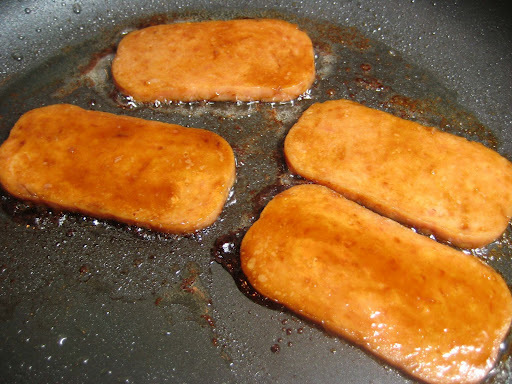 In case you're wondering, yes at that distance the time between 'phut' and 'dink' is a long one! We worked our way up through the calibres, the .22 first shooting a one inch group which then expanded to a four inch group. Phew! We we're now both able to blame the equipment. 200 yards is a long way in anybody's book! Parker Hale .308 - within 4.5in. at 200 yards and within 2in at 100 yards. My suburban air rifle practice is starting to make a difference! 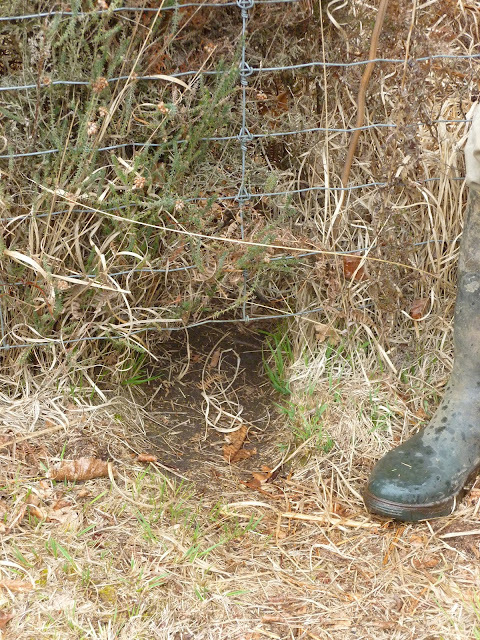 Remarkably, despite the range being 'well used', deer and fox trails cross the range, and both have been taken there. Perhaps this would be a good place to set a snare? Who's House? Mr Fox's House! We took a break for an amazing 'full english' breakfast and enough coffee to wake the dead, before dedicating the afternoon to bunnies. At the bottom one of the woods we had a great view of some dairy fields which the bunnies were busy mowing. I've never been very good at estimating range, in fact I'm so bad at it that you'd never get me to venture an opinion, having learned my lesson on one one of our trips to Jinx Wood, where The Bambi Basher had shown me the strange optical effect of 'dead ground' when a hidden dip in the terrain can double the perceived distance. HunterX is a very encouraging sort of chap, "I really think it would help if you were ten yards closer" he said. Holding our noses we crawled into a gully which gave us a discrete position to snipe at the Rabbits from, a position which sadly was well outside the .177 Phoenix's range, when after several misses we paced it out, turned out to be some 45 yards beyond the air rifles effective range. HunterX "thanks you've cured me of the temptation to buy an expensive air rifle"
renewed our appetites and we enjoyed forced down the worst Kebab and Cheese burger yet seen before heading to the high seats to try to catch the fallow having their evening meal. On the way we went to see a field outside the permission where this group of 70-80 Fallow were herding, Does, this years fawns and last years yearlings all being bossed about by a one antlered buck. HunterX reckoned he's soon be chased off by a master buck come the rut. 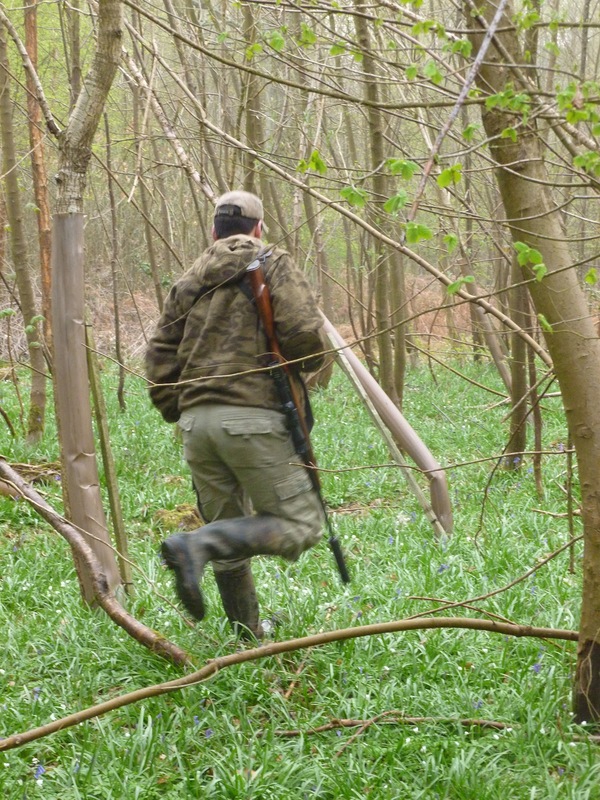 HunterX: "I guess I put you in the wrong highseat, I saw two prickets you could have shot, sparing with each other"
All in all a fantastic day afield, massive thanks to my host HunterX, one of the good guys. Reserved for Hunting - How's that for POSTED! While Shooter and I were traveling to the clay ground the other day the inevitable subject of Hook and Bullet magazines came up, and I remembered this post from a couple of years back. One of my favorites. Still as true now as it was then. The chef, writer , and wag Anthony Bourdain once said that you could tell a lot about a country by the food it eats and the pr0n it makes. I'd like to add to that list. Hunting magazines are also a window into the national physic. If anyone ever asks me if i'd like anything brought home I tell them 'Hunting mags and dried pork products'. I love hunting magazines for several reasons: the adventure stories, the kit reviews (because as regular readers will know I'm a sad kit-tart), and then there's the shameless dichotomy between the editorial standpoints of 'guardians of a noble tradition, champions of the simple life' and sell 'em a gadget to get the advertisers in'. Love it! While manly hunters mock girly fashion magazines they miss the point that the two genre's have grown out of a common desire - to sell advertising space. First hemlines will rise, then they will fall, _____ will be the new black, the first lady will first be elegant, then too thin, then too fat, before being found to have the dress sense of a cockney builder and the hair of a fishwife. Products and advice in next months issue will rectify these and other concerns. Meanwhile: Camo will be photo realistic and change seasonally, last years 'fleece technology' wont cut it this year, chokes will tighten, then be unnecessary, shotguns will get lighter, then they'll get heavier to soak up 'felt recoil', fleece will be out - wool back in, you like your .270? Have you considered a .280 yet? Here's a _____ made better by the addition of some photos of leaves. Products and advice in next months issue will rectify these and other concerns. In short if there's a chance of selling a double page spread to an advertiser, X will be the new Y and no one will ever know how we managed without it [for all these thousands of years]. Blaze orange is the must have colour of the season. Scent suppressing clothing is to be mocked. Knives are getting longer again and some come with a take down spear handle. Custom rifles aren't selling, as off-the -shelf now offers what was until recently not-at-any-price accuracy for a lot less cash. Take down rifles are the next big thing - convenient for the hunter to transport - convenient for the manufacturer to sell you another barrel for next year's cartridge. American rifles offer fantastic value for money, but if you had the cash you'd go german wouldn't you? Czech is somewhere in between. Tikka are so good for the money what's the point of SAKO? If your hunting magazine is offering you any more please let us know. There are lots of really cool torches available, and most of them run on CR-123A wonder batteries. Making them very bright but less than ideal for Bug-Out or just travel. They're called 'wonder batteries' because while in the back of beyond you'll be wondering how long it'll take to have some shipped to you in a one horse town where no one sells wonder batteries before you can use your 'super torch' to see in the dark. An activity I'd class as mission critical. Reliability and Availability the watchwords of outdoor equipment. Whatever it is, it must work when you need it to, and the stuff it eats must be available everywhere. The NiteCore D10SP runs on 'AA' which while not having the output of wonder batteries win out by being the most commonly available battery on earth, and a lot cheaper too. One of the clever things in the design is the contact-less switching (Smart PD System) where instead of the contact switches found in most electronic products Nitecore are using magnets to make the connection; meaning there can never be a spark between the switches parts (reassuring while looking for gas leaks) and with no moving part to fail reliability should be excellent. Once the light is switched on, pressing and holding the tail button cycles through three brightness settings: 130 lumens [1 hour], 35 lumens [6 hours] and 2 lumens [100 hours]. If you double click the tail cap it also has a very neat strobe function which would be very clearly visible, and run for a very long time in a survival situation. Takes One AA battery - yep the ones you can buy everywhere that power the rest of your kit! I got the black one but it's available in camo if you're the kind of person who likes to lose things.